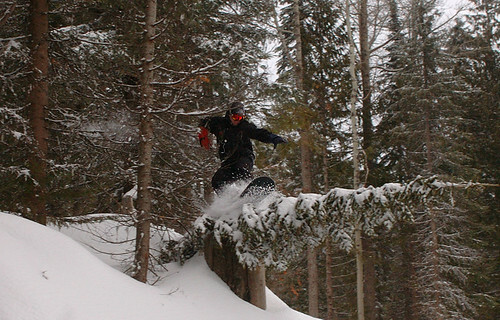 SkyTerra considers acquisition by a new corporation formed and indirectly owned by Harbinger Capital Partners. KVH announces distribution agreement with Japan Radio. The Russian Satellite Communications Company (RSCC) teams up with Romantis to offer satellite solutions in Europe, the Middle East, and Africa (EMEA). GAO denies SpaceX protest of launch contract with Orbital Sciences for scientific satellite for NASA in 2012. Orbital Sciences and Aerojet initiate engine tests of Aj26 liquid-fuel rocket for Orbital’s Taurus 2 medium-class launch vehicle. Thales Alenia signs with French Space Agency to build the Jason-3 oceanographic satellite. 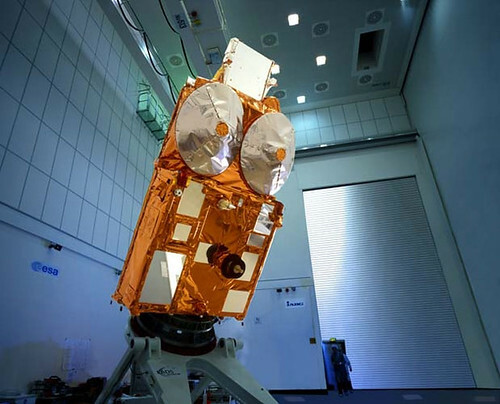 Globecomm Systems wins 3-year maritime managed services contract for Singapore based FACC Ship Managers Pte Ltd.
Thales Alenia Space delivers YahSat 1A communication module to EADS Astrium for integration on their platform. Among a series of satellites launched by NASA over the last decade to monitor the health of our planet, ICESat has provided a consistent big picture look at polar icecaps. Both payloads for the first launch of the year by Ariane 5 are in Kourou, French Guiana undergoing initial checkout for a March 24 liftoff. South Africa’s second satellite, Sumbandila, delivers its first live images. Boeing gets NASA approval to build new TDRS satellites series K and L..
Government Space Programs spend $68 billion in 2009. UPC Broadband consolidates its European DTH businesses to create a new company, UPC DTH. The Arab States Broadcasting Union, Arabsat, and Newtec will provide expanded services to additional customers on their TV/Radio contribution and exchange network. NDS selected by On Digital Media as technology provider and prime integrator to support the launch of its DTH platform in South Africa. Space junk mess gets messier as head-on collision between the European Space Agency’s Envisat Earth remote-sensing spacecraft and upper stage of a Chinese rocket is averted. 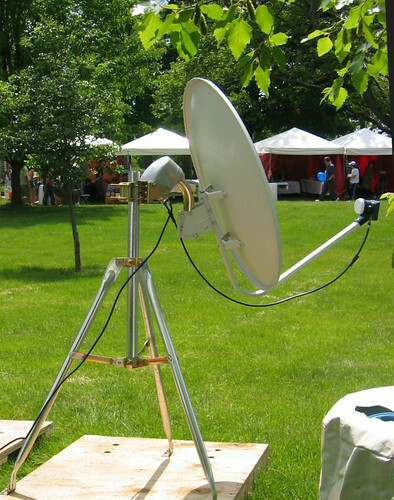 U.S. broadband stimulus funds of $100 million set aside for satellite projects in U.S. Rural Utilities Services and National Telecommunications and Information Administration notice falls short of expectations. SatMAX announces joint marketing plan with TLC Engineering for efficient disaster recovery. Expand Networks help optimize Global Satellite Services with Inmarsat. NASA, NOAA GOES-P meteorological satellite is lifted into the mobile service tower at Cape Canaveral Launch Complex 37 for March 2 launch. 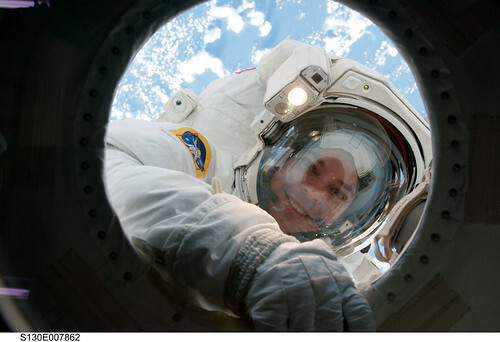 India plans to send two astronauts into space in 6 or 7 years. SpaceX’s Falcon 9 two-stage rocket hoisted into vertical launch position at Cape Canaveral in preparation for maiden flight later this year. TerreStar announces successful testing of Ground Based Beam Forming (GBBF); the system provides the flexibility to deploy over 500 spot beams and manage power and capacity; Terrestar to launch commercial service in first half of this year. Space Systems Loral ships communications satellite built for Dish Network to Baikonur Space Center for launch later this year. Cobham SATCOM’s USAT 24 60 cm (24 in) Marine Stabilized Antenna for the Sea Tel range of Ultra Small Aperture Terminals receives full accreditation FCC license as ESV. DISA and DoD award two contracts to Marshall Communications Corp for maintenance and support at Landstuhl, Germany, and Skyline, Falls Church DVB-RS hubs. Hughes announces availability of SCADA IP satellite terminal. Remember Devo? We do — especially their song "Timing X/Space Junk" from the 1979 album Duty Now for the Future. With their performance at the Winter Olympics in Vancouver the other night, they’re embarking on a comeback of sorts. Data from US military networks, and from independent German radar measurements show that the European Space Agency’s (ESA) huge Envisat satellite passed incredibly close to the spent upper stage of a Chinese rocket last month. Telemetry data showed that the two spacecraft zipped past each other separated by a distance of just 160 feet (50 meters), which had space experts on the edge of their seats. The recent incident again underlines the deteriorating condition of our planet’s orbit, which is becoming increasingly clogged with debris from all sorts of space missions. If the Chinese rocket had collided with the European satellite, the result would have been devastating. Envisat is one of the largest spacecraft in orbit, weighing in at around eight tons. The rocket stage weighs about 3.8 tons, so a combined mass of more than 11 tons would have been pulverized into fast-traveling shards. 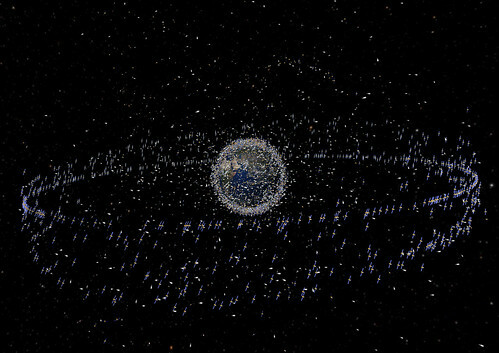 Such small pieces of metallic debris, which move with incredible speed, can cause a devastating chain reaction in orbit. If they impact other satellites, they have the ability to destroy them as well, creating even more shards and debris, and fueling the vicious circle. In order to avoid this scenario, European experts maneuvered their satellite using some of the propellant left onboard. According to ESA official Heiner Klinkrad, who is the head of the Space Debris Office, in Darmstadt, Germany, a collision between the two objects would have spelled “mayhem.” He explains that the altitude at which the two are currently flying is already littered with debris as it is, and that further impacts could reduce the chances of any other spacecraft passing through and onward into space. At the same distance from the Earth’s surface, a Russian Cosmos spacecraft collided with an American satellite early last year, producing a vast amount of debris. The other shards present in this particular orbit were generated by the Chinese anti-satellite test that was conducted in 2007. “The future environment is expected to worsen without additional corrective measures,” NASA Johnson Space Center chief scientist for orbital debris Nicholas Johnson says. He adds that five spacecraft belonging to the American space agency had to undergo collision-avoidance maneuvers last year. These included the Tracking and Data Relay Satellite (TDRS-3), Cloudsat, the Earth Observing Mission 1, Aqua, and Landsat 7. What’s more worrying, he adds, is that the International Space Station (ISS) and some shuttle missions also had to steer clear of incoming metallic fragments. “A penetrating object hitting the ISS, and possibly causing a casualty onboard […] I think that would be the most dramatic case we could have,” Klinkrad shares, adding that medical evacuations from the ISS are incredibly difficult to even plan, let alone perform. Currently, there are two Americans, two Russians, and one Japanese aboard the orbital facility. 50 km is really close. Did somebody on The Continent fall asleep? This isn’t supposed to happen as the path/orbit of every piece of space debris is known and can therefore be predicted and avoided. 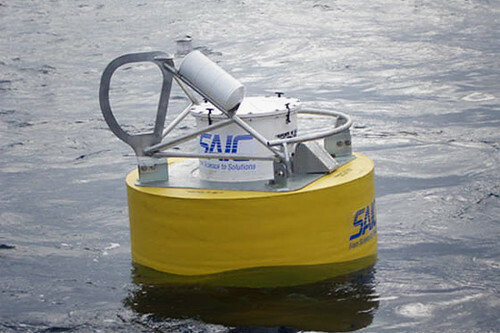 The SAIC Tsunami Buoy systems will be deployed at locations in the Bay of Bengal and off the northwest coast of India near the Makran subduction zone. 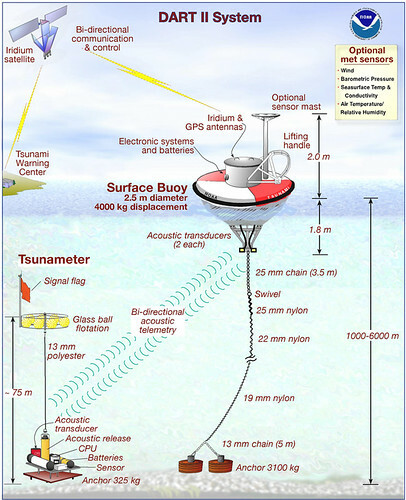 These systems represent a part of a larger network of tsunami buoy systems that will provide the entire region with critical data to assess the magnitude of tsunamis generated in the Indian Ocean. The eastern Bay of Bengal, one of the most seismically active regions in the world, is near the origin of the Boxing Day mega-tsunami that claimed over 220,000 lives in 2004. "The deployment of these STBs will provide the Indian regional tsunami forecast center with a foundation of reliable and technologically sound deep-water tsunami assessment systems," said Tom Baybrook, SAIC senior vice president and business unit general manager. "SAIC looks forward to a long term relationship with INCOIS supporting their extensive tsunami assessment network." The STB system consists of three subsystems: a surface communications buoy, a buoy mooring, and a bottom pressure recorder. The bottom pressure recorder includes a highly accurate sea floor pressure sensor which can detect earthquakes and sea level changes. Acoustic communications transmits the pressure data to the surface buoy which then relays the data by satellite communications to oceanographic forecast centers for analysis. Once processed, the data can provide real-time assessments of the characteristics of the tsunami in deep water. This data is then used with forecast models to predict the height of the wave and inundation when it arrives at a particular coastal location. How does it work? Check out NOAA’s DART specs. Satcom saves lives. More power to them! Launcher concern causes delay of the European Space Agency’s Cryosat-2 mission. Spain will provide technology expertise for a communications satellite to be built for the Norwegian army. European Space Agency panel puts off decision whether to participate in Japanese-let infrared space telescope pending further discussion regarding Japan’s commitment to the project. GSA and DISA initiate 10 year $5 billion dollar government wide procurement that will cover purchases of commercial satellite services and hardware by the military and government agencies. Thales Space reports 3% decline in space-based revenue, but a sharp increase in new orders. BusinessCom, a global satellite telecommunications service provider, launches Advantage IP VSAT service, based on Ku-band IO satellites, covering more than 18 countries in the Middle East and parts of Asia including Iraq and Afghanistan. Crew aboard International Space Station relocate cupola from Tranquility’s forward port to new location facing the Earth, resulting in a "phenomenal view." Thales Alenia Space ships second ComSatBw satellite to the Kourou spaceport for a launch on March 24 by an Ariane 5 ECA. Eutelsat switches planned launch this year of its W3B satellite from a Chinese Long March vehicle to a European Ariane 5 rocket amid concerns about insufficient supply of non-U.S. components to allow export of the satellite to China. Settlement apparently reached in dispute between SES and Boeing over claim that Boeing violated violated a contract to rebuild a large SES-owned satellite destroyed during a 2007 launch failure. Spot LLC, a wholly-owned subsidiary of Globalstar Inc., begins shipping the new SPOT Satellite GPS Messenger to its customers and retail partners. exactEarth Ltd., the data services subsidiary of COM DEV International Ltd., signs $1.4 million contract with Canadian Space Agency to provide data collected by its AIS nanosatellite. AXIO-NET, a subsidiary of Astrium Services, will provide satellite positioning data to be used in construction of a motorway and rail link between Germany and Denmark. Members of the Air Force Joint Functional Component Command for Space at Vandenberg AFB provide satellite communications and navigation services in support of relief efforts in Haiti. Space Micro to develop space communications hardware compatible with wide variety of existing communications systems, and is not susceptible to damaging effects of radiation. Steve Wozniak, a co-founder of Apple, to deliver opening keynote address at MILCOM 2010. 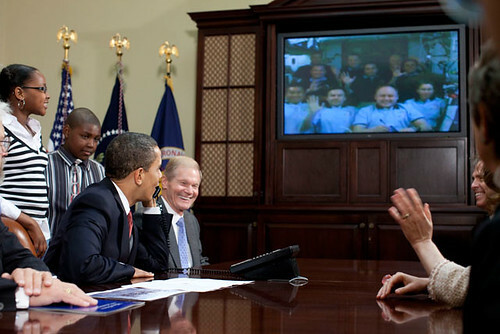 President Obama tells astronauts aboard the International Space Station that he is committed to space, in spite of having scrapped the Constellation program to return to the moon. EchoStar subsidiary Sling Media announces that Bell TV will license SlingGuide to deliver advanced TV search, remote scheduling, and recording services to its customers. Tremendous expense of all aspects of the satellite industry to be addressed at Satellite Finance Forum sponsored by Futron Corporation and Access Intelligence March 15. Latitude Technologies Corp. announces IONode 100 onboard system integration product and Air Tanker Information System software to provide system monitoring and data distribution when connected to Iridium-based SkyNode product. Motorola files with U.S. Securities and Exchange Commission, claiming that GHL Acquisition of Iridium last year constitutes "change of control" and demands $24.7 million in cash from Iridium or it will deny Iridium technology required to build replacement satellites. Solaris Mobile, Dublin-based operator of new pan-European hybrid satellite and terrestrial wireless networks, announces development of mobile gateway device allowing reception of S-band services on smart phones. MapMart introduces free downloadable MapMart On-Demand Toolbar for ESRI ArcMap which allows ArcMap users to highight any area within their GIS project and instantly search MapMart database for matching geospatial data sets. GMV successfully tests satellite ground segment of World Space Observatory Ultraviolet mission, an international project led by Russian Space Agency ROSCOSMOS. 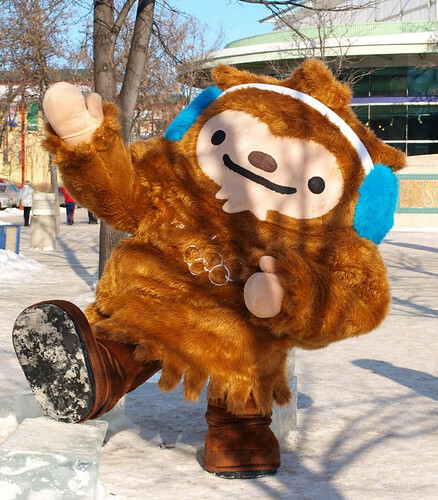 GlobeCast teams in Vancouver, BC, provide services including playout, live positions, and HD/SD delivery of Olympic Winter Games content to clients from around the world. Nagravision announces that their conditional access system was selected by SkyLife, the only DTH pay TV service provider in Korea. SkyTrac is selected by Aerospace Consortium FZE of Dubai to supply SATCOM/flight following solutions for Aerospace’s diverse fleet of airplanes and helicopters. Orbit Technology Group receives order from Lockheed Martin for advanced tracking antenna solution for flight tests. SES S.A. reports 25% growth in earnings per share for period ending December 31, 2009. Boeing ships the first Global Positioning System IIF satellite from El Segundo, CA to Cape Canaveral Air Force Station aboard C-17 Globemaster III airlifter. Groupo Televisa of Mexico agrees to purchase 30% share of Mexican telecommunications unit of NII Holdings for $1.55 billion in cash. 25 U.S. companies to participate in International Trade Administration’s first trade mission to Algeria and Libya include AAE Systems, Inc., a satellite equipment manufacturer and turnkey communications solutions provider. SES, seeking to refocus the satellite industry’s approach to managing and preventing RF Interference by engaging with 15 other satellite operators on a series of initiatives, adopts GVF’s Installation Training Program in order to help prevent RF interference. Russian Prime Minister Vladimir Putin proposes introducing the Glonass navigation system throughout the country’s regions to be used on trains, aircraft, water and public transportation. Newtec shows broadband potential of Sat3Play at Neureus workshop, attended by representatives of the European Commission, who agreed that satellite Internet should play a vital role in an integrated approach to reaching full broadband access across all of Europe. The Satellite Broadcasting and Communications Association will hold its first Regional Chapter Meeting of Satellite Professionals on March 4th in Wilmington Delaware. Small Scottish company Selex Galileo wins funding to complete development of an orientation system for satellites. Iran reveals development of new Simorgh space booster and three new satellites, including an imaging satellite which may provide Iran with rudimentary space reconnaissnce capability. Israel Defense Force plans to equip all infantry and armored brigades with ground based satellite antennas developed by Gilat Satellite Networks which can relay information during operations behind enemy lines. U.S. Air Force’s second geosynchronous Space Based Infrared Systems satellite completes successful first BaseLine Integrated System Testing at Lockheed Martin Space Systems facility in Sunnyvale, CA. Legislation to renew the satellite television law governing transmission of broadcast signals by U.S. DTH providers dies in U.S. Senate as cuts are made to make underlying jobs legislation more targeted. SES, in middle of largest satellite-buying spree in its history (15 new satellites to be launched between 2010 and 2014), says the new capacity will continue to earn about $1.5 million per year in transponder lease revenue, and that SES will slow down capital spending next year. On the road again? Tailgating? No TV where you are? Bet you’re bummed you missed Anja Paerson’s crash in the downhill at the Winter Olympics in Vancouver. If you’re RVing across North America (or caravaning in Europe), you’re got a few options. In the U.S., there’s Backseat TV from Sirius XM, but that’s for kids (although they’re potentially entertaining for some adults). For real "on the move" satellite TV, be prepared to spend a few thousand dollars for a KVH Tracvision A7. Sadoun has them at discount, as well as others. You could also pay half that for a VuQube, essentially a portable contraption with an antenna inside that’s nearly self-pointing. There are other motorized solutions out there, but it won’t be cheap. What about doing it yourself? 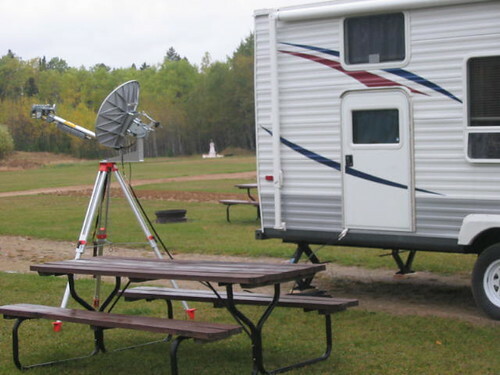 Get an extra antenna, mount it on a tripod, grab your home satellite receiver and hit the road. You’re only going to watch TV after you park your vehicle, right? For some, this may sound simple, but it gets complicated in a hurry. The satcom techs who do home installs are trained and get it done quickly, after they do their homework. The spacecraft orbits at 22,300 miles (36,000 km), so you’ve got to know where to point that antenna. 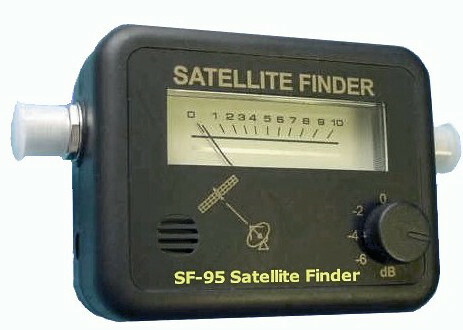 You can probably get yourself a signal meter (like the SF-95), calculate your look angle (elevation & azimuth) and point your antenna. Sure, you’ll need a compass and your geographic coordinates (long/lat). You may not know that when you’re "out there." How do you know whether you can "see" the satellite from where you decided to park? What if you didn’t do your homework ahead of time? Get yourself a good app phone like the Apple iPhone or Google Android, then download the DishPointer Pro AR app. Launch the app, then point it toward the southern horizon if you’re in the northern hemisphere, and toward the northern horizon if you’re in the southern hemisphere. On the equator, point straight up. Like magic, using the phone’s camera, shows you what you can see and whether any obstacles on in the way. 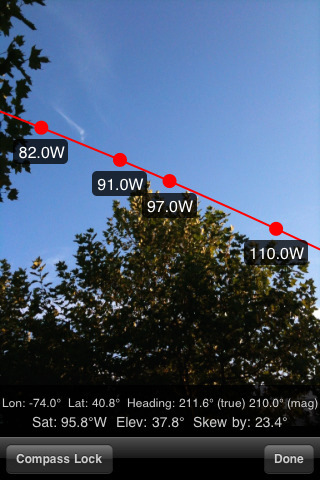 Hit compass lock and you’ve got elevation, azimuth and skew (polarization). Is that awsome or what? 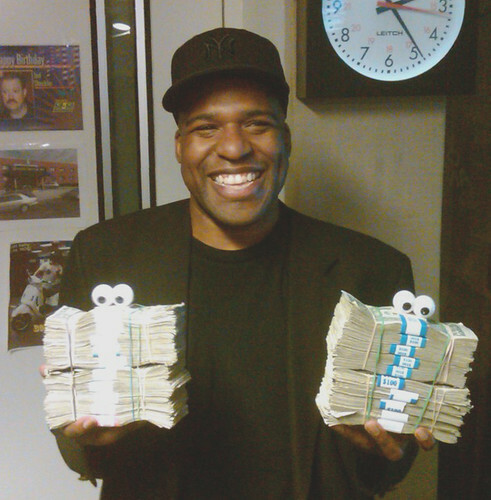 $20 gets you the app, available via the Apple iTunes App Store and Android Market. And it totally works. Feels like somebody’s watching you! Boeing appears to have paid satellite fleet operator SES of Luxembourg about $23 million to settle a claim that Boeing violated a contract to rebuild a large SES-owned telecommunications satellite that was destroyed in a 2007 launch failure, according to financial statements from the two companies. Neither SES nor Chicago-based Boeing has commented directly on the matter. Boeing said the settlement is confidential. SES spokesman Yves Feltes on Feb. 18 confirmed that “a mutually satisfactory agreement” had been reached with Boeing but declined further comment. But in their 2009 year-end financial reports and investor conference calls earlier this year, both companies point in the direction of a settlement, for approximately that amount, of an issue that Boeing long dismissed. 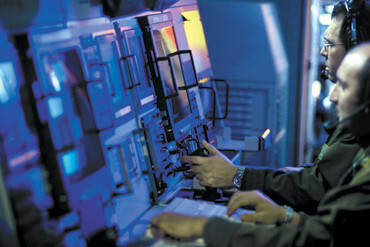 The dispute began following the January 2007 on-pad launch failure of a Sea Launch rocket carrying the Boeing-built NSS-8 telecommunications satellite, which was owned by SES. SES subsequently said the NSS-8 manufacturing contract included an option under which SES could order Boeing to build a carbon copy of NSS-8 under essentially the same contract terms. SES officials said that when they notified Boeing of their intent to exercise the option, Boeing resisted. Satellite prices had increased substantially from the time of the initial NSS-8 contract in March 2001. Boeing had long since lowered its profile in the commercial satellite market, saying prevailing prices could not justify a major Boeing presence. Boeing said SES in May 2009 filed a dispute-resolution request with the International Chamber of Commerce in London, but never spelled out how much money SES was seeking in reparations. “We believe that SES New Skies’ claims lack merit and intend to vigorously defend against them,” Boeing said in the July 2009 SEC filing. In a Jan. 27 conference call with investors, Boeing Chief Financial Officer James A. Bell said Boeing late in 2009 booked a one-time charge in its Network and Space Systems division relating to a “legal settlement associated with a contract” that, when combined with a write-down in the value of Boeing Delta 2 rocket hardware, totaled about $50 million. In Boeing’s Feb. 8 filing with the SEC, the company refers to a “Dec. 23 confidential settlement agreement with respect to all claims” by SES relating to the NSS-8 replacement dispute. In its Feb. 12 announcement detailing its financial results and a conference call with investors the same day, SES makes reference to a one-time charge and a one-time revenue gain in late 2009, with roughly a $4 million difference between the two. The company refers to a write-off, valued at 19 million euros ($27.2 million at year-end exchange rates), relating to payments made to Long Beach, Calif.-based Sea Launch Co., which since mid-2009 has been in Chapter 11 bankruptcy reorganization. We won’t soon forget what happened to NSS-8. A satellite TV upstart has won limited approval to do business in Canada. The new company, FreeHD Canada Inc., applied in August for permission to offer a package of local television channels for free – if customers agree to buy the equipment necessary to pick up the company’s satellite signal. BCE Inc. and Shaw Communications Inc., which operate Bell TV and Shaw Direct respectively, have made similar proposals. FreeHD is also planning to offer an additional package of 150 pay and specialty channels. Yesterday, the Canadian Radio-television and Telecommunications Commission approved the licence, but said that FreeHD will have to operate under the same rules as other satellite providers. That means its basic package cannot include local stations only; such providers are required to include certain channels, such as at least one CBC station and one Radio-Canada, APTN and the Weather Network. The larger pay package must also follow rules requiring services like adult channels to be optional to consumers. Read all about the "approval, in part" on the CRTC site. Since Dave Lewis is running things at FreeHD Canada, I suspect he’ll be using some capacity on the Ciel-2 spacecraft. If the box and dish cost $300 or less, this ought to sell like waffles on a Sunday. Almost as exciting as Maelle Ricker’s gold medal at the Winter Olympics in Vancouver. Solar Dynamics Observatory and its Atlas V rocket blast off from Cape Canaveral launch pad in blustery weather. 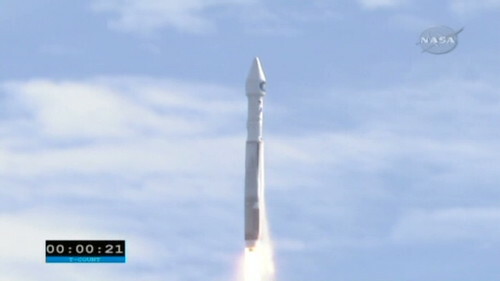 Russia launches Intelsat 16 satellite built by Orbital Sciences aboard Proton rocket from Baikonur cosmodrome. Thales Alenia to build civil, military satellite for French and Italian space agencies CNES and ASI. MTN Satellite Communications introduces new flexible, cost-effective satellite communications service for megayachts with varying bandwidth requirements. Bolivia creates space agency for Chinese satellite. Spaceport Systems International, a partnership between ITT Corporation and California Commercial Spaceport, Inc., contracts to provide spaceport launch services for U.S. Air Force. ESPN expects 3-D HD live event broadcasts will be important for company’s future. 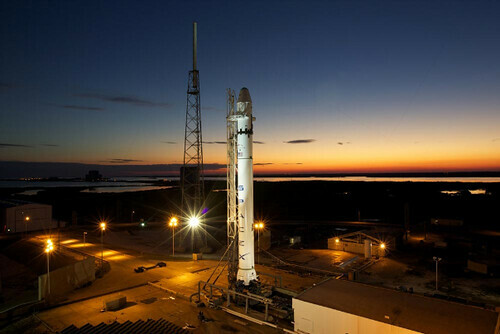 SpaceX announces that all flight hardware for the debut launch of the Falcon 9 vehicle has arrived at the SpaceX launch site in Cape Canaveral. NASA Landsat 7 images of Winter Olympic Games site in Vancouver, British Columbia shared with SatNews. SES WORLD SKIES reaches agreement with the Andean Community of Nations regarding long term use of the 67 degrees West orbital position. Satellite Users Interference Reduction Group receives 2010 Industry Innovator Award from the Society of Satellite Professionals International. ASTRA 3B arrives in French Guiana, the first of two satellite payloads for Arianspace’s initial Araiane 5 mission of 2010. Arianespace is selected to launch the French-Italian Athena-Fidus dual use satellite. 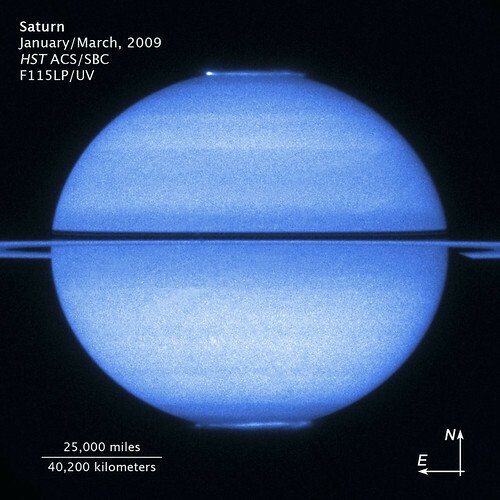 Hubble Space Telescope captures image of Saturn with its rings edge-on, taking advantage of a rare opportunity. SES and International Launch Services announce ILS Proton launch of SES-3 satellite with the Kazsat-2 satellite during 2010. PolarSat Inc successfully completes system acceptance testing and 6 months of live operation of a disaster relief VSATPlus 3 VSAT network. Globalstar undertakes construction of satellite tracking station in Botswana, in Southern Africa. Satellite TV company FreeHD Canada wins limited approval from the Canadian Radio-television and Telecommunications Commission to operate in Canada. GeoSpatial Experts announces the U.S. government has approved four of its pphoto-mapping product bundles for direct purchase by federal agencies. Russia wants to charge for for rides on its Soyuz rocket. India to launch an intelligence satellite designed to pick up conversations and detect espionage activities. Costa Rica’s National Telco to deploy a Gilat SkyEdge II satellite network to provide broadband communications to corporations nationwide. The Rural Utilities Service (RUS) preparing a request for proposals related to satellite broadband and may allocate $100M or more in stimulus money. GSA, DISA ready $5B satellite opportunity. Telespazio renews contract with Eutelsat. TS2 Satellite Technologies company introduces new broadband services on Eutelsat EB4 & W6 satellites for the Afghan market. 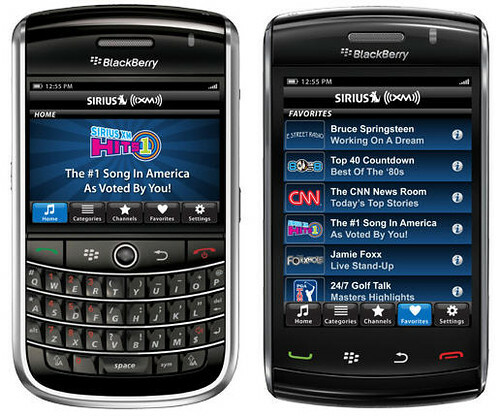 Sirius brings satellite radio to the BlackBerry. Spacecom announces additional clients since announcing operational status of AMOS-5i on January 28th. Iridium Communications selects Hughes Network Systems to develop Access Network Controller in its gateway ground radio control network. Globalstar and Arion form joint venture to offer mobile satellite services in Korea. China International TV Corporation, a division of Chinese state broadcaster CCTV, contracts with Castalia Communications to deliver TV content to Latin America. Commercial Satellites: The Pillars of Government and Military Satcom?